You just climbed to the top run of your tree steps to start your deer hunt. Like many people, you attach your safety rope and clip onto it before you make the transition from the steps to the stand. As your weight shifts from your left foot on the steps to your right foot on the stand, the stand platform pivots, you lose balance, and you fall backward off the stand. Luckily, you had already clipped onto your safety rope and your fall is successfully stopped by a TMA approved safety harness system. You are now dangling 18’ in the air. You have a couple of bruises, but you’re not seriously injured. All is good – right? Well, not exactly. Ways to position your stand, steps, and safety system in the event of a fall. 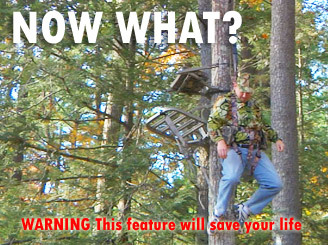 You can die from a treestand fall even after your full-body safety harness has stopped it and you never hit the ground! It is called suspension trauma and it can kill you if your blood is not properly circulating through your legs. The first signs of suspension trauma is dizziness and fatigue. Eventually the person suspended will black out and die if they remain in a suspended state for long periods of time. For this reason it is critical that you have an exit strategy after you’ve fallen. Unfortunately, most people never give consideration to what to do after they’re suspended. 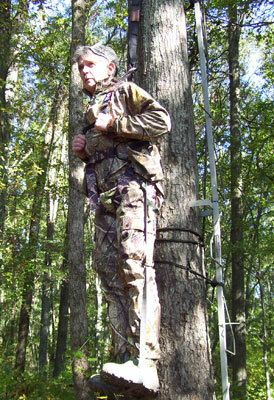 While researching this feature we reached out to Keith Jones of Summit Treestands. Keith probably knows more about treestand safety equipment and techniques than anyone else in our industry. He was the original developer of the Seat-O-The-Pants (SOP) safety harness. Keith has spent a considerable amount of time designing harnesses that not only protect you from a fall, but which are also designed to prevent suspension trauma. He has also tested and perfected techniques that he shared with us when we were producing this article. 1. Tether and tree rope as high as possible - The most important consideration with your setup is the position of your tether and tree rope. The tree rope and tether should be high enough so you can feel a gentle tug on you when you lean forward while sitting in your treestand. The higher up you can get this tether, the quicker it will catch you, and suspend you within reach of the treestand. You do not want to fall 3’ below your stand as you’ll have no way of reaching it. Many guys put the rope at chest level, but this is incorrect. It should be above your head. Remember, the rope and tether will stretch and the harness will naturally shift up when you fall. Besides the safety aspect, a high tether provides a natural pivot point above your shoulders which allows you to move freely in your stand. 2. Tether positioned where you want to fall - Assuming you have positioned the tether as high as possible, where the tether connects to the tree rope will determine where you will hang. For example, a tether connected 6” to the right edge of your treestand will swing you out (in a fall) and land you to the right of the treestand. (hang on with steps) If you’re like me you probably run your steps up the left side of the stand so you can step down and onto the stand with your right foot. So wouldn't’t you naturally position the tether to the left of your stand so you are hanging right next to your treesteps? Maybe, but I prefer not to do this since you can be seriously injured or impaled by the metal treesteps. Instead, position your tether connection as close as possible to your stand. It should be within easy reach so you can try to climb back onto it. (Climbing Stand) Climbers are easier. 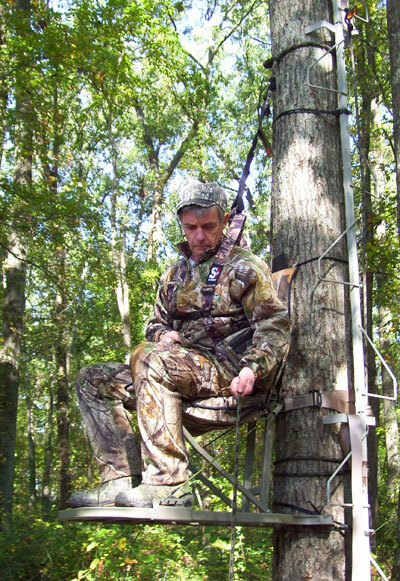 Assuming you have positioned your tether so you can reach your climbing treestand, you can simply lift up the platform section and lower the stand until you can safely step onto it. As always, be sure your hand portion and platform are connected by a cord or rope. And whatever you do don’t let it slide down the tree, if that happens you are in serious trouble. Carry the following items in a pouch or pocket of your safety harness. If you wear your harness under your coat, keep these items in your coat pocket. Cell Phone – always have a cell phone and call someone after you fall. Whistle – remember the movie titanic? Same principle applies here. 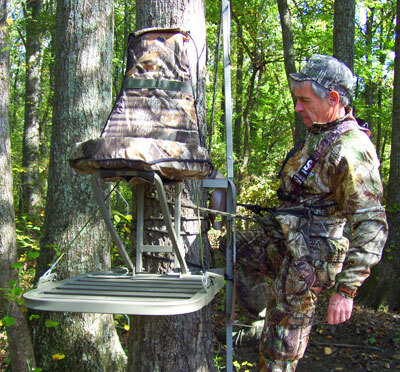 Folding Tree step - in the event you are unable to climb back onto your stand use one of these. Folding Pocket Knife – there are many uses for this, just make sure it’s folded. This 5-minute instructional video shows you actual falls and recoveries for all the scenarios below. Pull out your Tension Relief Strap and tie the lose end to the lineman D-ring. Stand up to relief tension immediately, occasionally switching legs. Pull out your cell-phone and call someone who knows where you are. Tell them your exact location, the time you fell, and your status (injured, bleeding, etc). Tell them your plan and ask them to call back within 5 minutes. Instruct them if they do not hear from you to send help immediately. Flip around to face your treestand and pull one leg out from your Suspension Relief and place your knee on the stand platform and stand up. Place a call to the contact you phoned while hanging and give them your status and any additional instructions. Reach the lowest strap-on tree step you can and swing it around so you can stand up on it. Do this with each step until you can reach your treestand. Climb into your treestand and place a call to the contact you phoned while hanging and give them your status and any additional instructions. Reach into your vest and pull out a screw-in tree step. 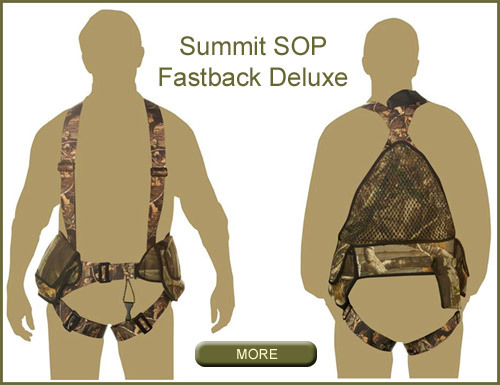 Use this to climb back onto your treestand. Flip around to face the tree and gently lift up the platform section of your climber and continue lowering it until you can easily place your foot on the platform. Always wear your harness - we'd like you to visit us again!